The Conservatory of Flowers in San Francisco’s Golden Gate Park is one of many beautiful spaces to relax and enjoy nature in the city. The beloved local gem, and top tourist attraction, is a place where you can connect with the abundance of the Earth and join the San Francisco community in a shared love. The Conservatory is a historic landmark where San Francisco residents, and city visitors, have gone for more than a century to view Victorian architecture and gorgeous flowers. It’s a place worth visiting at least once in a lifetime so that one can take in the stunning sight of perfect wood and glass building design along with a tale of San Francisco history, as told by brilliant blooms and blossoms. The Conservatory of Flowers is the oldest wood and glass conservatory open to the public in North America. It’s a San Francisco, California, and National Historic Landmark, and it’s one of the most photographed attractions in the city. During the 19th century, conservatories were pretty common among North American aristocrats. The wealthy built greenhouses on their estates and constructed glass rooms in their mansions. They had tropical plants sent to their California homes from around the world, by botanists and explorers who were often hired to stock the rich’s greenhouses with rare and exotic varietals. Around this time, successful businessman named James Lick ordered a greenhouse for his estate in Santa Clara. Before he could erect it, he passed away, so the parts remained in crates for decades. In 1877, Lick’s trustees put the greenhouse kit up for sale and a prominent group of San Franciscans bought it. They offered it to the city and it became the Conservatory, which opened to the public in 1879. From the Conservatory’s first day of public viewing, it was a treasure in Golden Gate Park and one of the most visited attractions in the rural space within a city. After a few incidents of damage and destruction throughout the years, and subsequent reconstruction and renovation, the Conservatory has remained a fixture in San Francisco. In 1998, the World Monuments Fund placed the Conservatory on a list of the 100 Most Endangered World Monuments. Many historical preservation groups, and national council projects, have raise funds to help rehabilitate the Conservatory after various disasters and to keep it protected so that the public can continue to view its beauty. The Conservatory is a place where plant enthusiasts, botany students, cultural groups, and everyone can stroll through special floral exhibits and learn about landscapes. At the Conservatory, guests sometimes find displays featuring pre-historic flowers as well as exhibitions teaching about carnivorous plants. Horticulture classes take place at the Conservatory, and inspiration is all around in the form of living walls and other beautiful creations. If you’d like to learn more about the Conservatory of Flowers, or find out how you can visit, head over the Conservatory’s website. You’ll be able to view hours and days of operation, and you can get directions to the attraction. The Conservatory of Flowers in San Francisco’s Golden Gate Park is one of many beautiful spaces to relax and enjoy nature in the city. 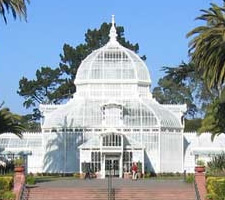 The beloved local gem, and top tourist attraction, is a place where you can connect with the abundance of the Earth and join the San Francisco community in a shared love.The Conservatory is a historic landmark where San Francisco residents, and city visitors, have gone for more than a century to view Victorian architecture and gorgeous flowers. It’s a place worth visiting at least once in a lifetime so that one can take in the stunning sight of perfect wood and glass building design along with a tale of San Francisco history, as told by brilliant blooms and blossoms.